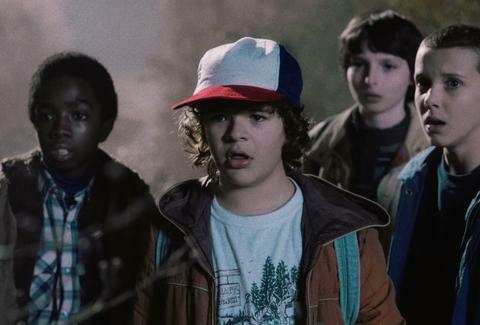 It's clear that Netflix's breakout summer series Stranger Things is an enormous hit. Judging only from the rabid fan response, the bizarre theories that have popped up, and Aaron Paul's very real obsession with it, we can tell many, many people have spent the balmiest month of summer getting lost in the Upside Down. And now we have the (somewhat questionable) numbers to back it up. Yesterday, Deadline reported that, according to independent data-collection company Symphony Advanced Media, Stranger Things is the third-highest rated show, with an average viewership of 14.07 million adults (ages 18 to 49) in its first 35 days on the streaming platform. Only Orange Is the New Black and Fuller House top it, though both have considerably more name recognition and star power than the relatively unknown cast of young kids on Stranger Things. This is a big win for Hawkins, Indiana. Of course, it's important to approach these numbers with some of the skepticism that Chief Jim Hopper has about the interdimensional conspiracy in his town. Symphony, which is quickly positioning itself as the streaming era's answer to the Nielsen ratings, uses audio recognition to track streaming viewing habits on devices. Netflix's CEO Ted Sarandos has criticized the company's findings as "remarkably inaccurate." Whom can you trust? It's difficult to know if Sarandos' claims are legitimate. Netflix is notoriously tight-lipped about its own internal ratings data, despite declaring certain shows and movies hits. Last year, Adam Sandler's The Ridiculous Six was heralded as the company's most-watched movie ever. The company's announcement didn't come with verifiable numbers. Like Matthew Modine's secretive Dr. Martin Brenner, Netflix runs a tight ship. Now how long do we have to wait for Stranger Things Season 2?